Join the hero Oscar, the pomaranyan PomPom and the fair princess Linga on an epic quest to reach another town. There's a witch somewhere in there too. Princesses and Witches Jam came out of nowhere, it really blindsided me. If it's fantasy, it has to be an RPG*, right? Usually, they're no fun for small projects due to their scope creep and the large amount of features necessary to get even the most basic gameplay loop working. So I just said whatever, and took most of those out anyway. I hope you still enjoy it! If you get bored, try to spot all the RPGs* I borrowed stuff from. * RPG is a registered trademark of Bandai (KK). Extract the folder and open Schildburg.exe. Burn the .cdi file to a CD-R using Padus Discjuggler 6.0 (https://legacy.padus.com/produ...). CD-RWs will not work. Burn at slow speeds, if possible. Put the CD-R in your Dreamcast. 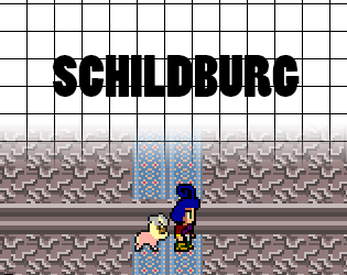 If it shows -Schildburg executable- during the Sega logo screen, you did everything correctly.